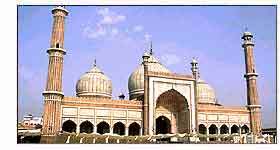 Full day city tour visiting Raj Ghat and Shanti Vana - the cremation sites of Mahatma Gandhi and Jawaharlal Nehru, Jama Masjid and drive past Red Fort and Chandni Chowk. Afternoon visit Qutub Minar built by Qutub-ud-Din Aibek in 1199, Humayun's Tomb, India Gate (War Memorial Arch), Lakshminarayan Temple - a modern Hindu Temple. Also drive past President's House, Parliament House, Government Secretariat Buildings & Connaught Place shopping centre. Overnight Delhi. The day is to be started with the Elephant / Jeep ride at Amer Fort, followed by the city tour covering - Hawa Mahal, Royal Observatory, City Palace, Nawab Sahab Ki Haveli and Johari Bazar etc. Overnight at hotel. 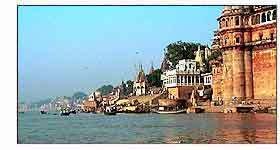 Arrive Varanasi in the morning. Later proceed for the city tour visiting various temples including The Vishwanath Temple, built by the Birlas, was planned by Pandit Madan Mohan Malaviya. The Bharat Mata Temple houses, instead of gods and goddesses, a huge relief map in marble of the whole of Indian subcontinent. The Tulsi Manas Temple, built in 1964, is dedicated to Lord Rama. Evening view "Aarti" ceremony on the Ghats. Overnight stay at the hotel. Morning we take a Boat cruise at the river Ganges to observe the way of life of pilgrims by the Ghats and later we drive to Bodhgaya (242 kms / 7 hrs). Arrive Bodhgaya and check - in at hotel. Bodhgaya is the most sacred place for Buddhists as it has a Peepul tree under which Gautama the Buddha attained enlightenment some 2500 years back. Overnight stay at the hotel. After breakfast drive to Patna, enroute visit Rajgir & Nalanda. 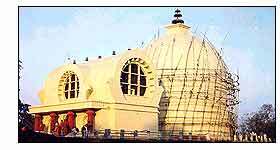 Rajgir is 70 kilometres away from Bodhgaya. Lord Buddha spent many months of retreat during the rainy season here, and used to meditate and preach on the Griddakuta, he hill of the Vultures. It was in Rajgir that Buddha delivered some of his famous sermons and converted King Bimbisara of the Magadh Kingdom and countless others top his creed. The places of interest are the Vishwa Shanti Stupa (built by the Japanese and can be reached by a chair lift rope way), the Griddakuta (where Lord Buddha used to preach and alongside is the cave of his most devoted disciples Ananda), Ajatashatru's fort (built by Ajatashatru's, king of Magadh), Bimbisara's Jail (where the king Bimbisara was imprisoned by his impatient son Ajatashatru), Swarna Bhandar (the treasury of Bimbisara) and then there are the Hot springs and more than 26 Jain temples around Rajgir. Continue drive to Nalanda (14 kms), founded in the 5th century BC, Nalanda was one of the worlds greatest universities, and an important Buddha centre until it was sacked by the Afghans in the 12th century. When the Chinese scholar and traveller, Xuan Zhang, was here in the early 7th century AD, there were 10,000 monks and students in the residence. The brick-built remains are extensive and include the Great Stupa, which steps, terraces and a few intact votive stupas around it, and the Monks cells. There is also an interesting archeological museum housing the Nalanda University seal, scriptures and other remains found on the site. Continue drive to Patna (145 kms / 4 hrs) and check - in at hotel. Post lunch city tour visiting Har Mandir Sahib - also known as Patna Sahib consecrates the place where the 10th Guru of the Sikhs Guru Gobind Singh was born in 1776; Golghar - is a large dome-like structure from where one can have a fine view of the Ganga and the surroundings of the city; Patna Museum - has a rich collection of Mauryan and Buddhist sculptures, terracotta and other interesting items of the items. Overnight stay at the hotel. Morning drive to Kushinagar (253 Kms - 06 hrs). On arrival check - in at hotel. Later we visit the Rambhar Stupa - which marks Buddha's cremation ground. Our second stop is Mahaparinirvana temple - which houses the recumbent figure of Lord Buddha. Overnight stay at the hotel. Morning drive to Saravasti (216 Kms - 05 hrs). Visit Sahet-Mahet. Overnight stay at the hotel. Half Day sightseeing of Lumbini and later at 1545 hrs. transfer to airport to board flight for Kathmandu. Arrive Kathmandu at 1620 hrs and transfer to hotel. Kathmandu - surrounded by green hills and mountains with snow-capped peaks against its northern and eastern background the Valley is indeed beautiful. Overnight stay at the hotel. After breakfast we embark on a city tour of Kathmandu visiting Pashupatinath Temple - the most sacred of the Hindu temples in Nepal dedicated to lord Shiva, built in 1696. We carry on the sightseeing tour of the Patan - a city of architecture and fine arts. Sometimes known as "Town with a Thousand Golden Roofs". Visit Tibetan Handicraft center at Jawalakhel to watch carpet weaving. Post lunch Sightseeing tour of Swayambhunath - the oldest Buddhist shrine. Looking east from here, one can see the entire Kathmandu valley spread out below. A short drive will take you to Boudhanath - the worlds largest stupa; a sight of great reneration to the Buddhist. We continue to Kathmandu Durbar Square - the temple of the Living Goddess and the old Royal Palace. Finally, visit Kasthamandup - a temple built from a single tree from which the Kathmandu derives its name. Overnight at the hotel.